I've run my weighted random number generator 50,000 times and it spat some numbers back at me. Having looked at said numbers, such is my narrative: the Houston Astros will be good again. Based on my Opening Day RPScores, this season simulation estimates the outcome of each game of the 2018 season the aforementioned 50,000 times and averages the season results together. The simulated results are, in this sport without much upward or downward mobility on a year-to-year basis, largely the same as last season's actual results. 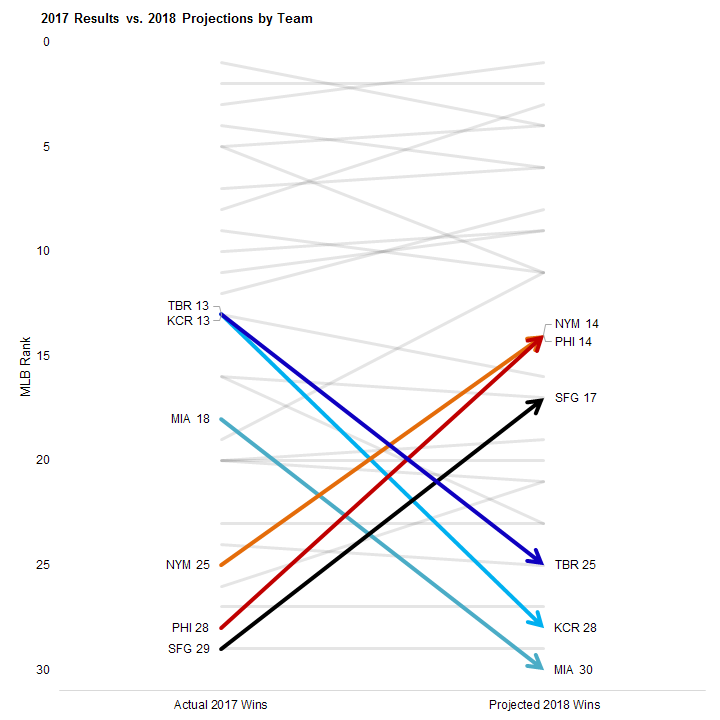 Non-amnesiacs will notice that the only difference between this year's projected playoff teams and last year's actual playoff teams is the seeding: all five teams are the same, but this time I forecast the Yankees beating the Red Sox out for the AL East title and the Astros finishing atop the AL. Other results of note include unfavorable projections for the Tampa Bay Rays and Kansas City Royals. Both the Rays and Royals finished 80 - 82 last year, ranked 13th in MLB in wins. This year I'm projecting Tampa Bay to finish 25th overall with a disappointing 71 - 91 record. KC should do even worse, finishing 28th overall at 68 - 94. I project a tiny bit more movement on the NL side, maybe? The division winners look to be the same as last year's, with some jockeying between the Washington Nationals and Chicago Cubs for home field advantage in a best-of-five. Last year's first two out look to be the first two in, and vice versa. In other imaginary results news, I'm projecting major rebound seasons for the Philadelphia Phillies, New York Mets and San Francisco Giants, with the Phightins' rebound from 28th to 14th overall perhaps the biggest surprise yet to happen. On the flip side, the Miami Marlins' fire sale will likely cause them to plummet from mediocre to worst-of-class, or something close to it. Worth remembering: the error bars are huge this time of year. 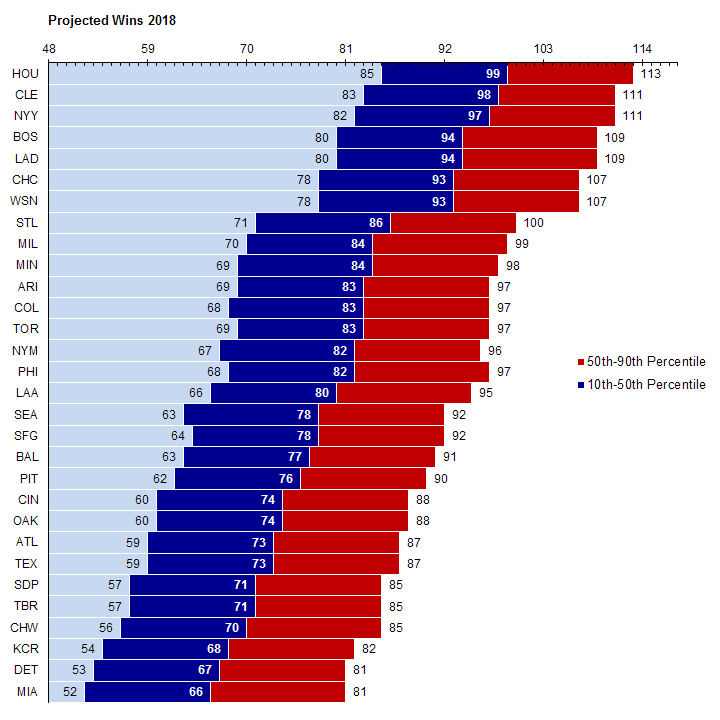 Yeah, there's an 90% chance the Astros will win 85 or more, but there's a lot of meat in the middle of the s-curve. I'll be here to document the surprises as they come.